Also sometimes called "pinkeye", this is more often seen during the summer months and during fly season. 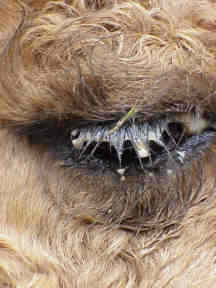 Although it appears painful and often has a yellowish discharge which covers the swollen eye, the condition can luckily be remedied rapidly with a sterile cleansing of the eye and the treatment of a topical ointment from your veterinarian. Tips for applying eye ointment: With clean fingers, pull out the bottom lid of the eye so it forms a little pocket. If using an ointment, squeeze a bead of ointment along the bottom lid, close the eye and rub gently to spread it into the eye. If using eye drops, just drop the liquid medication into the "eye pocket". 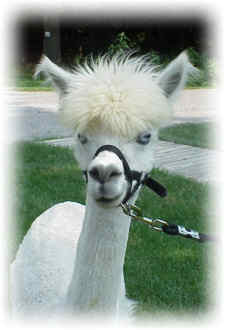 This is best done with the llama in a restraining chute. If you don't have a chute and are doing it by yourself, tie the llama snugly to a post so he can't move around. Giving him a handful of grain before and after administering the medication may help him not object as much. environmental irritants, or parasites and should be further checked by your veterinarian. this trait. The blue eye is thought to be possibly inherited. Does a blue eye result in deafness? not hold true for pure white llamas as well. the fact that it increases the likelihood that they are deaf if they have a white hair coat." the majority of breeders, an animal with a blue eye can still place well in the show ring if deserving. The blue eye is thought to be possibly inherited. See more info about blue eyes and deafness here. 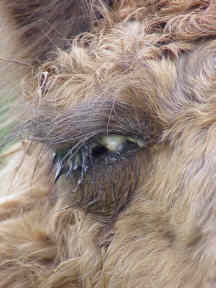 Some lamas tend to exhibit the drooping eye when they are somewhat stressed. This can also be a genetic trait and you will notice it the majority of the time. If you only notice it on occasion, notice what is happening each time - the animal is probably showing a slight stress to the situation. If the lid continues to droop even in the times of relaxation, the animal is probably prone to drooping lids. Not the best trait in the world, but not earth shattering either.